The best kitchens aren’t necessarily the most extravagant or theme-heavy, but an expression of your own personal taste at no cost to practicality. 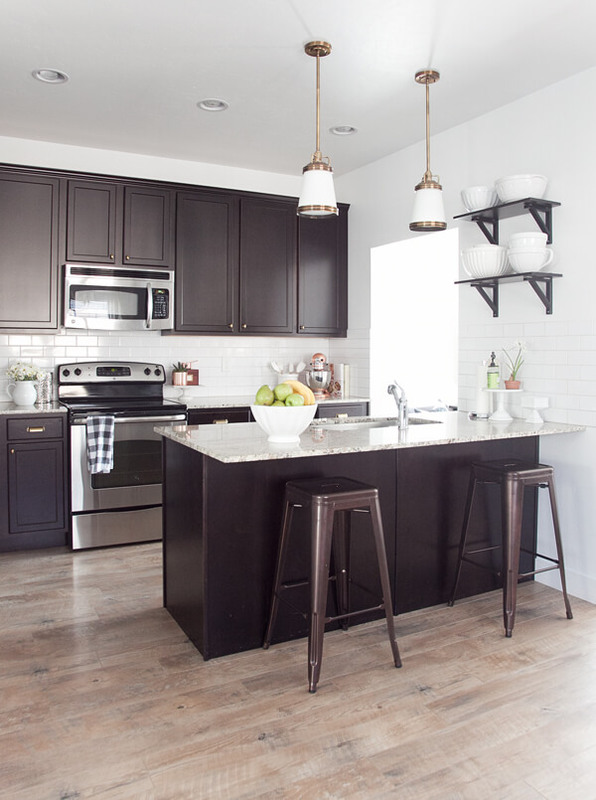 From simple but homey signs to brilliantly reimagined lighting fixtures, along with an array of counter and cupboard materials, your kitchen provides a unique opportunity to show off your individuality without breaking the budget or sacrificing comfort. Rich colors like ebony and wood switch up the time-honored kitchen white, while artisanal details and bright touches of flora & fauna keep the atmosphere warm and welcoming. And who could underestimate the power of a perfectly placed island with personalized seating arrangement? The kitchen has long been regarded as the soul of one’s home, a place of nourishment and connecting with loved ones. These 20 exquisitely simple kitchen ideas ensure years of enjoyment and ease of use, with a motif for every taste and preference. Now that the new year is upon us, why not try out some of the ideas featured below and celebrate your kitchen’s true potential? 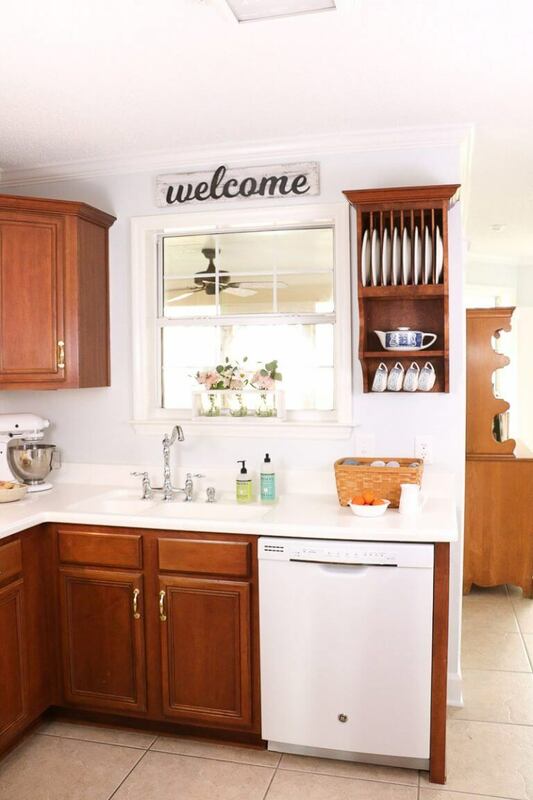 Sometimes all it takes is a subtle touch to brighten your kitchen, and this simple Welcome sign is the perfect finishing touch on this sparkling white-and-wooden kitchen. Even if you find yourself working with minimal space and style inspiration, those special touches go a long way in creating the perfect kitchen scape. Italy has long inspired some of the most breathtaking homes, and this elegant white-tiled kitchen leaves a lasting impression of the ‘boot. White tiles and touches of greenery keep the atmosphere light and chic, while a faded antique rug adds a uniquely bohemian accent, proof that you don’t need to travel far to bring a bit of the wider world home. Sometimes the most understated colors and textures, when combined, make the most dramatic effect. 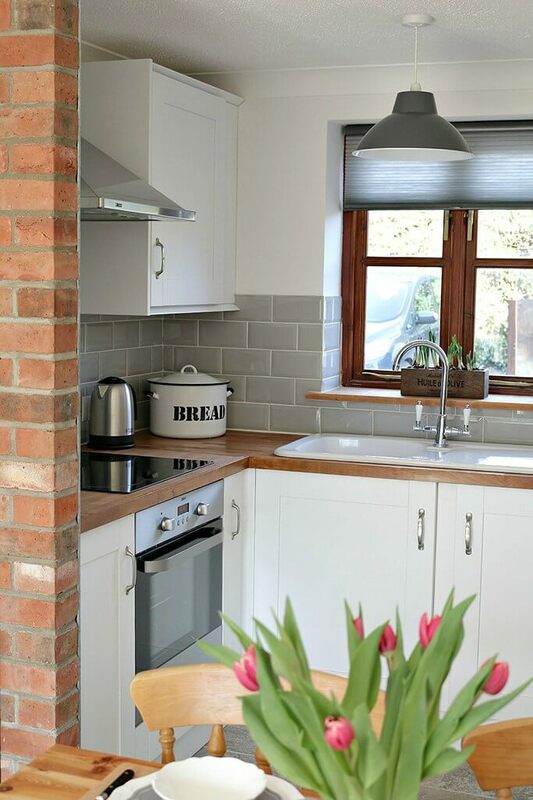 This classic Earl Grey toned kitchen boasts a surprising bit of splendor thanks to subtle brickwork and a poignantly selected floral bouquet of tulips. 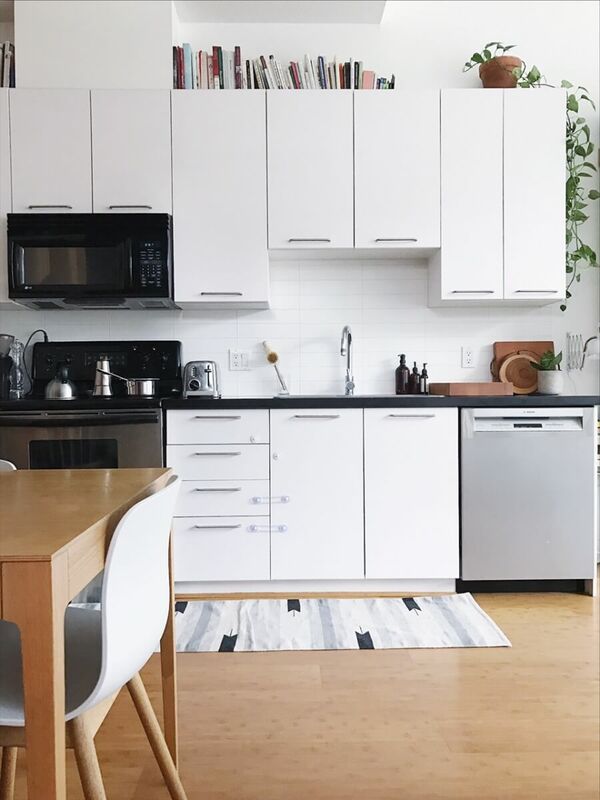 Taking a page from what could easily be an upscale metropolitan design magazine, this simple and chic kitchen comprised of spotless modern cupboards and sleek wooden flooring is sure to stay on-trend for years to come. 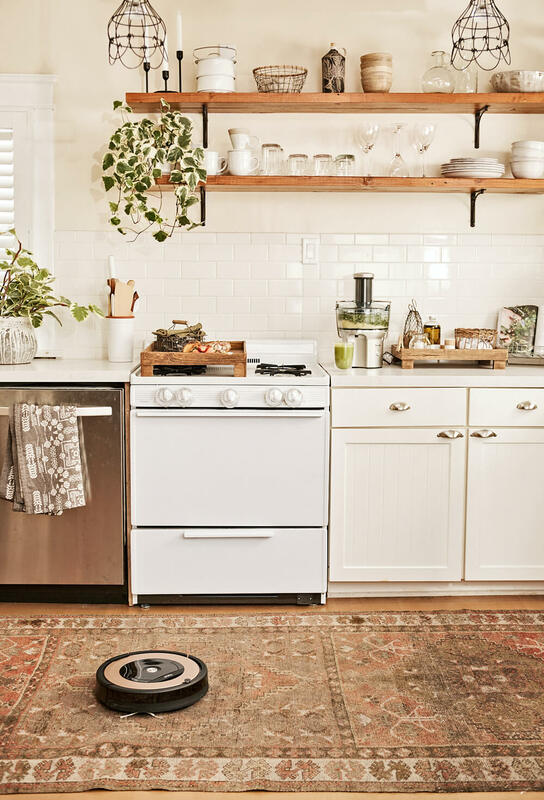 A geometrically patterned floor rug lends comfort and texture, while generous shelf space allows for all your favorite cookbooks. 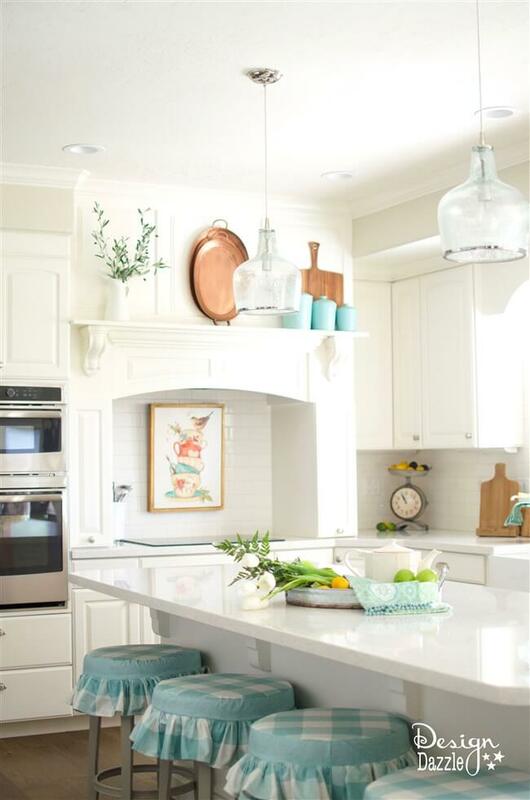 Like a beloved beach house or quiet retreat, this kitchen evokes the calming pastimes so often missed thanks to today’s hectic pace. Guests gathering around this luxurious granite table will rejoice in every painstaking detail, from the exquisite overhanging light fixtures to artistic centerpiece. And let’s not forget the elegant and irresistibly comfortable seating! 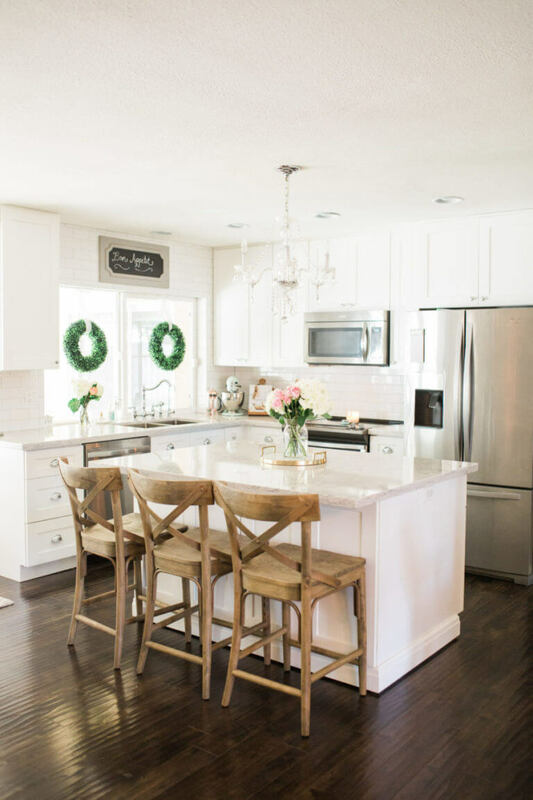 One oft-overlooked kitchen design idea places special emphasis on space and guest seating, and this spacious white kitchen with standout island (punctuated by a lovely floral arrangement) sets the perfect example. Whether it’s the season for entertaining or simply being the best year-round culinary host possible, this simply splendid kitchen setting will no take make you the toast of the town. Inspired by the chateaus of France and timeless charm of the provincial region, this decadent kitchen still strikes a surprisingly cozy note. 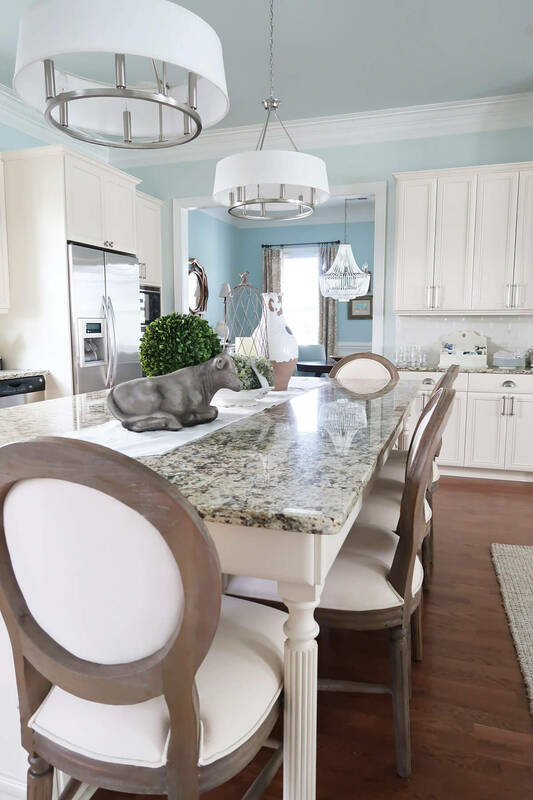 With its unique accent pieces, lovely floor rug, and stunning island, guests and inhabitants alike will no doubt make this kitchen the favored destination. 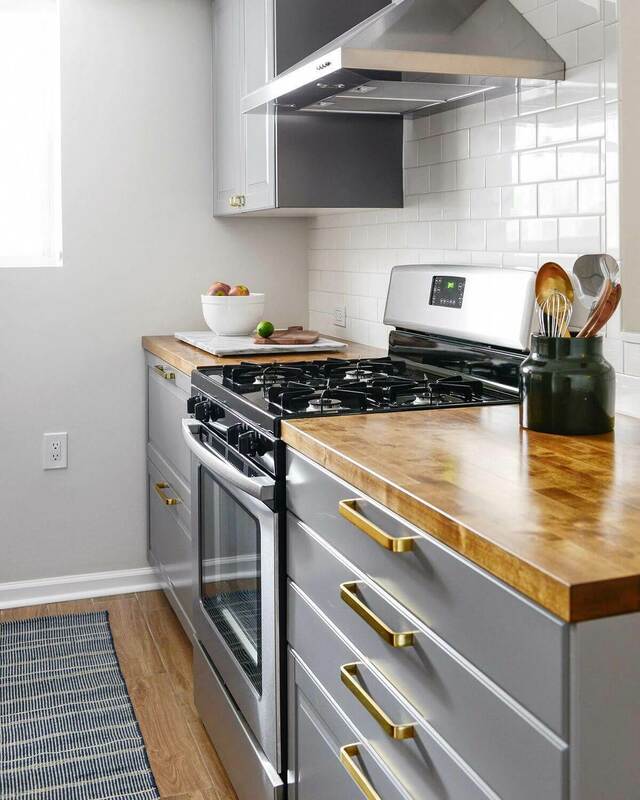 True culinary devotees desire a kitchen they can spread out and work their magic in, where bowls and cutting boards are the accent pieces and space is the greatest asset. With its grand polished floor and cheerful green floor covering, freestanding island with sink, and plenty of cupboard and refrigeration space, this is a kitchen for the true chef at heart. 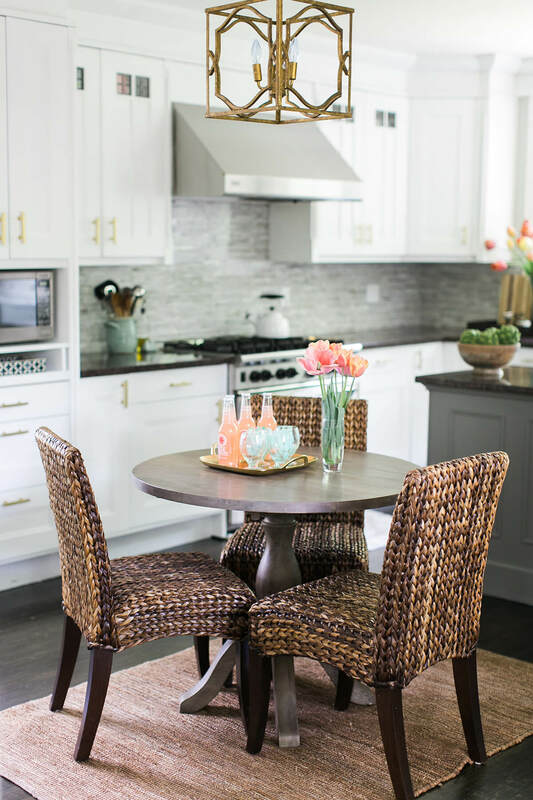 The tropics make for some truly irresistible kitchen design ideas, and this seductively simple kitchen arrangement is nothing short of paradise right in your own home. A handwoven mat and equally artisanal seating arrangement are illuminated by a reimagined lantern-style lighting fixture, while stylish touches here and there add accent and personality. 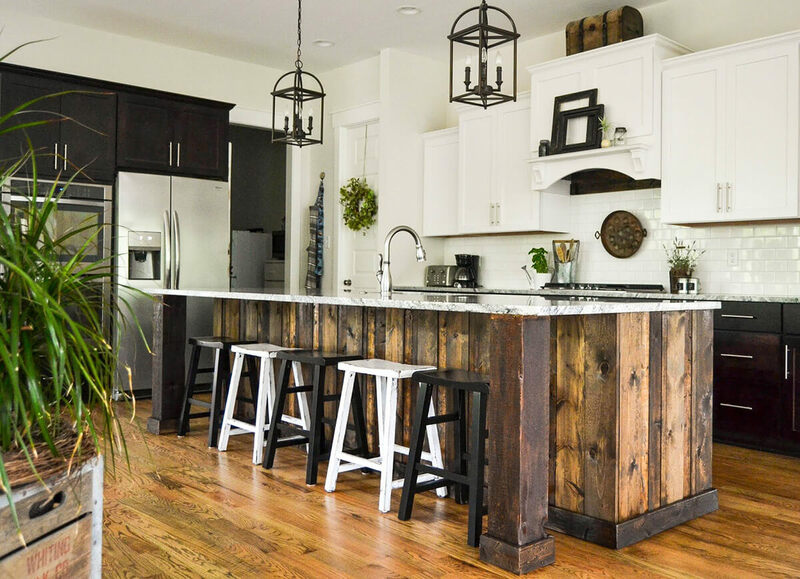 Harking back to the natural elegance of the Pacific Northwest, this spacious kitchen with repurposed wood-paneled island echoes the region’s laid-back and effortless style. Wrought iron lighting fixtures compliment the impressive marble countertop, while plenty of perfectly planted greenery keeps everything organic. 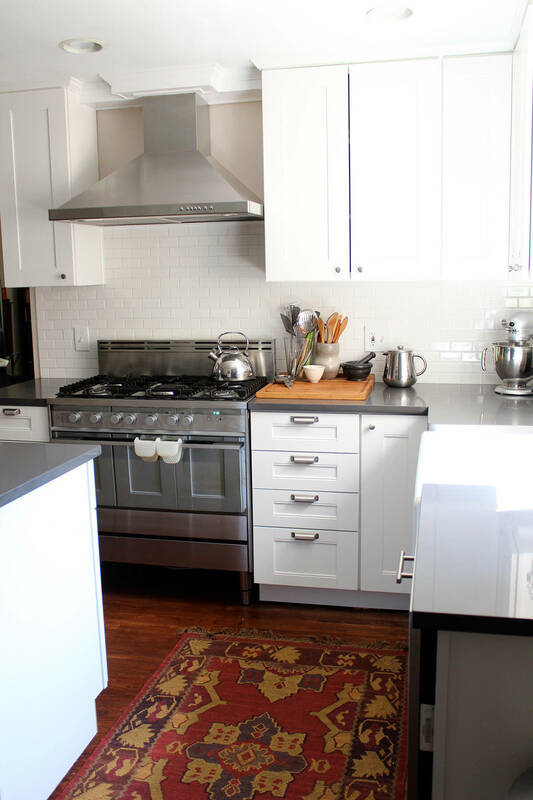 A beautifully crafted rug can transform any kitchen into a truly personalized space. 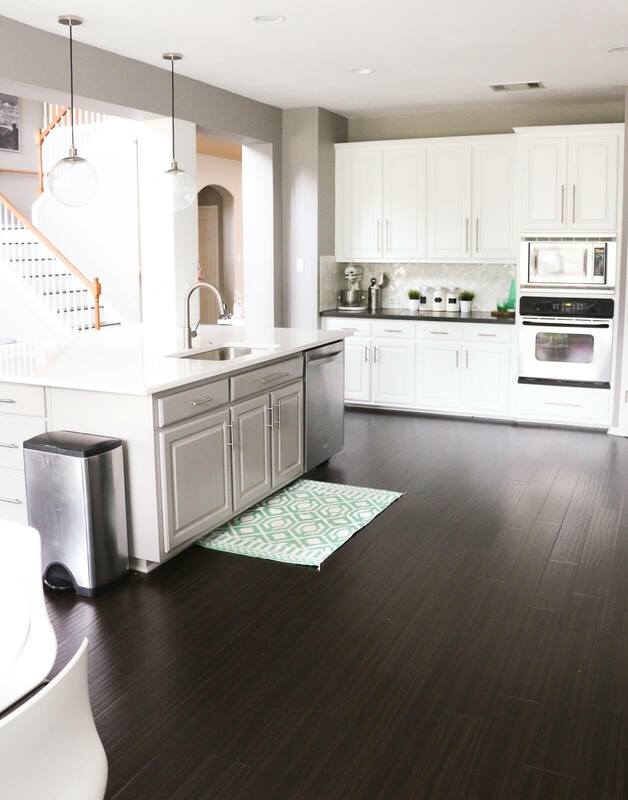 This chicly sparse kitchen enjoys an instant upgrade thanks to an exquisite floor covering that lends both beauty and comfort in abundance. Remember, sometimes the simplest addition–like a distinctive rug–can make all the difference you desire. 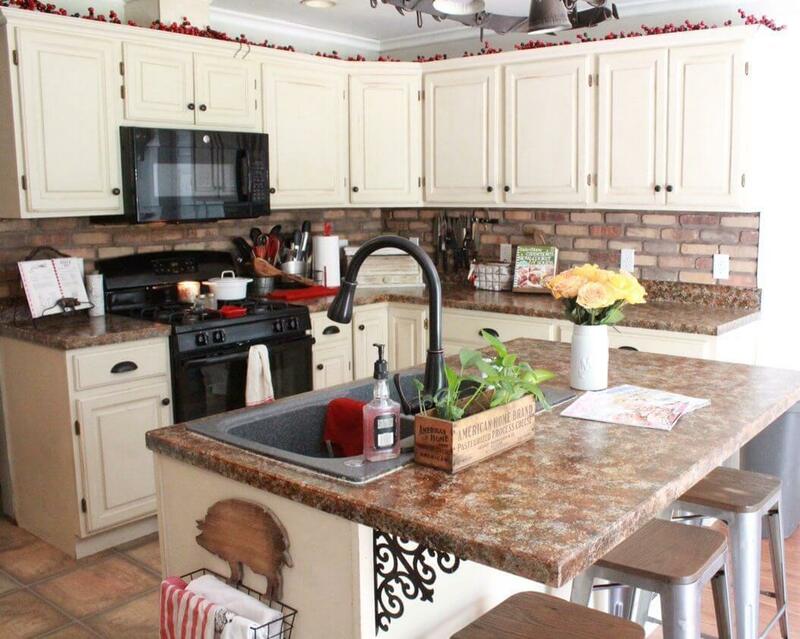 There is more than meets the eye in this cleverly charming kitchen, from the wooden pig paper towel dispenser to festive garland bordering the cupboards, finished with a Victorian-inspired wrought iron scrollwork piece. 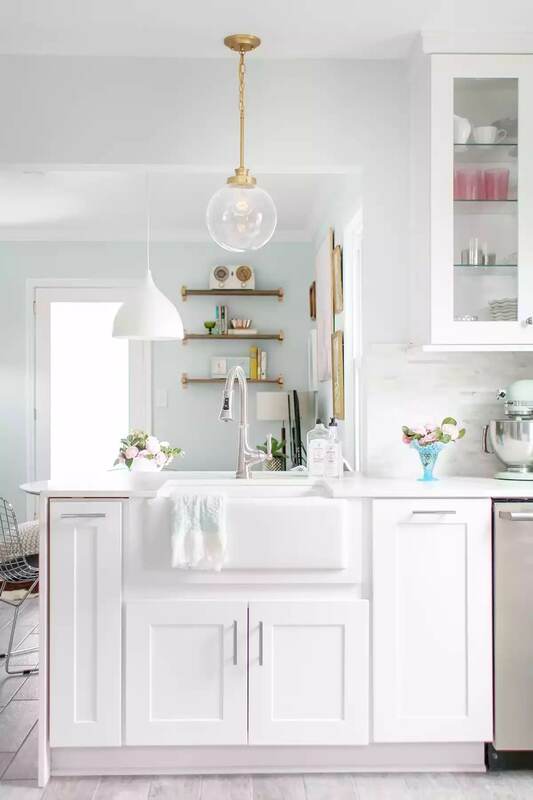 Bright and inviting, the creamy cupboards and expansive marble countertops keep things modern while the eye-catching touches add individuality to every corner. Keeping a spotless kitchen is on almost everyone’s to-do list, and this dazzling display proves that cleanliness can be done with style. 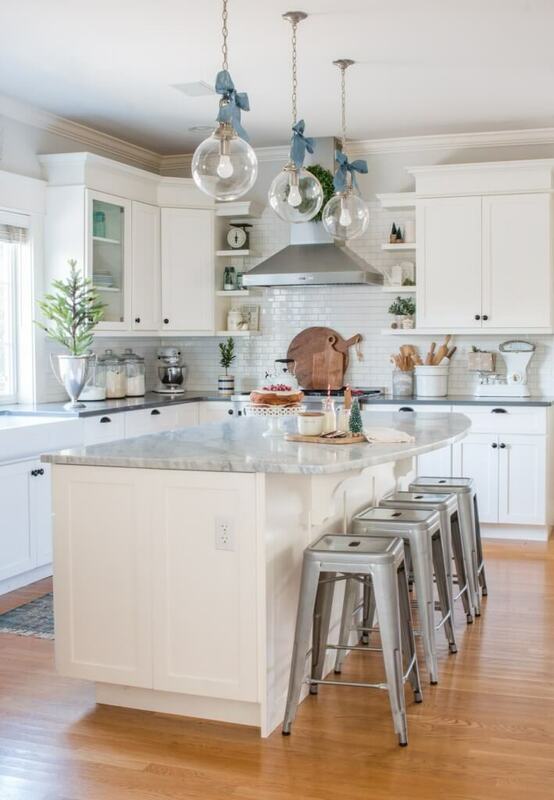 From the glass domed lighting fixture to gracefully placed floral displays, cooking and entertaining alike are as easy as they are inspired. The beauty of minimalistic kitchens lies in their potential for stand-out details, and a few artful touches can make even the cleanest kitchen pop. There are few pairings as unique as wood and stainless steel, the combination of old world and haute modern aesthetic promises optimum efficiency and timeless taste. With details such as copper handled drawers and casual throw rug, this kitchen keeps the atmosphere effortlessly up to date but infinitely welcoming. The pastoral farmhouse has long played an inspirational role in kitchen design, with updated visions such as this including lovely gingham seat coverings, copper cooking ware, and cozy teatime art. With its striking balance of dark and light, ample space, and conversation-starting vintage lighting detail, this kitchen provides the perfect backdrop for luxurious meals and year-round entertaining with all the style and minimal fuss. 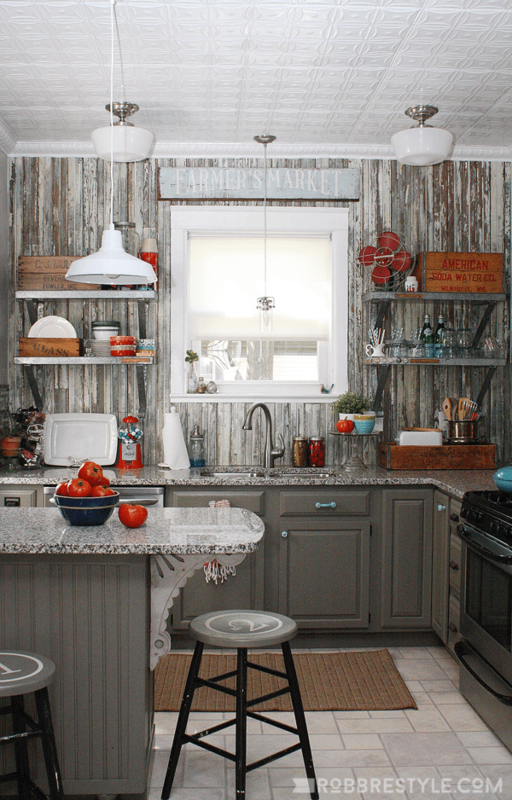 Few color combinations pop like red and gray, and this kitchen immerses country pastimes with modern implements. Ash tree wall paneling sets a striking scene, while charming details such as teal drawer handles and a Farmer’s Market sign bring everything back to the hearth and home. This classic kitchen wins instant modern points thanks to its trendy retro counter seating and gaslight-inspired lighting, along with the ingenious use of a trophy for plant display. With all the space one could desire and simple ivory storage spaces, elegance has never looked so easy. 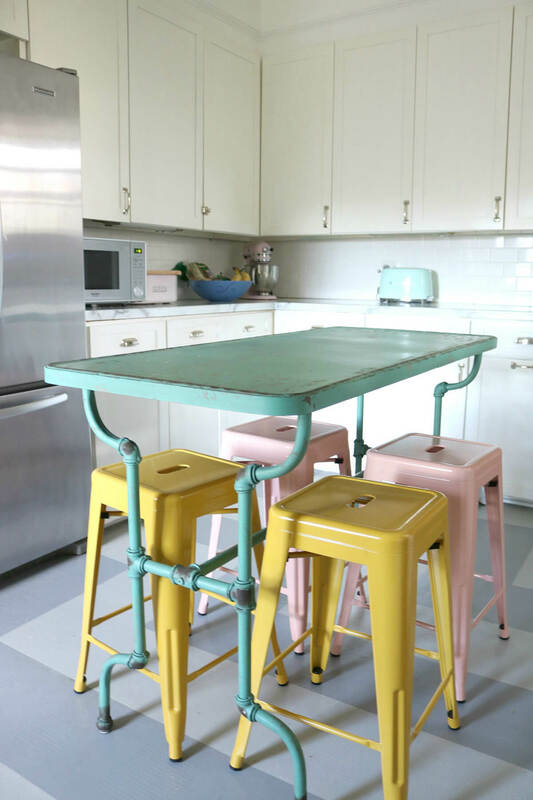 Vintage hardware and the pastel colors of Miami provide the perfect kitchen design idea to add instant on-trend appeal to any kitchen space. 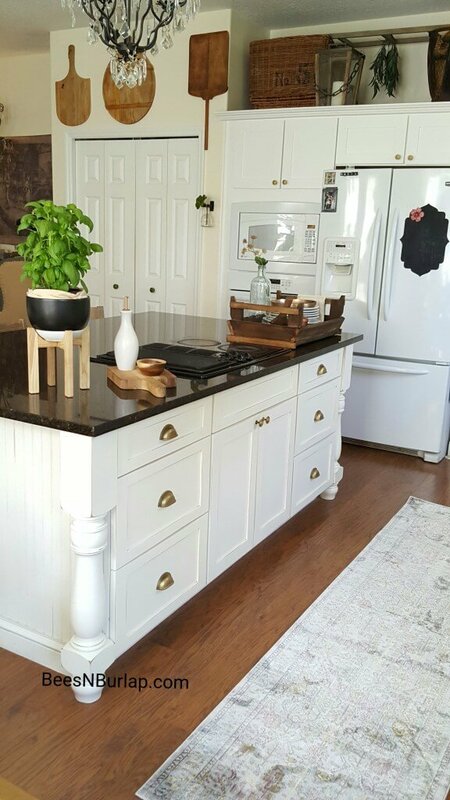 Whether you’re working with a limited amount of space or simple wish to update your kitchen, this island arrangement is an editorial worthy way to add some spice to your kitchen scene. 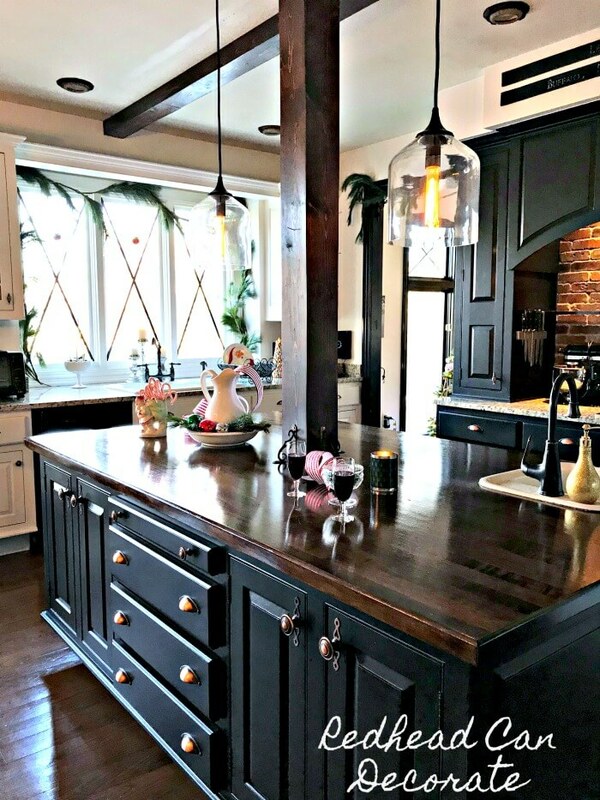 Dark is far from drab thanks to this gorgeous kitchen, which utilizes the space with rich wood and ebony counters and storage spaces, along with festive garlands of Douglas fir. Open dome lighting and large, latticed windows ensure that plenty of light gets in, all the while further enhancing the dramatic brickwork and color schemes.